Enjoy a delicious maitake mushroom and cauliflower stir-fry filled with cancer-fighting ingredients. Cauliflower is a powerhouse vegetable that deserves a regular rotation in your diet, thanks to an impressive array of nutrients, including sulforaphane, a sulfur compound that has also been shown to kill cancer stem cells and slow tumor growth. Aromatic and flavorful, garlic is high in certain sulfur compounds that are believed to be responsible for its very positive effects on human health. Eating garlic regularly may help prevent heart disease, stroke, and cancer, as well as reduce infections. Maitake mushrooms may play a role in the protection against various cancers. The key compound found in maitake mushrooms contains D-Fraction, a polysaccharide with the ability to enhance certain immune system cells, such as macrophages, helper T cells, and cytotoxic T cells, which all work together to attack tumor cells. 1. Prepare the maitake by cutting into 1⁄4 inch thick slices. If using shiitake, quarter if large and halve if medium. 2. 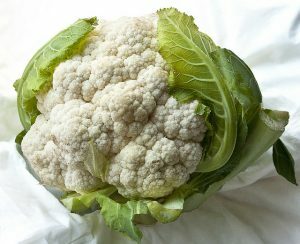 Prepare the cauliflower: separate into florets, square the stems and slice. 3. Fill a large bowl with water and ice cubes. Bring a good amount of salted water to a boil in a wok. 4. Add the cauliflower and blanch for 30 seconds, drain, and transfer it to the ice water. 5. When the cauliflower is cold, drain it, transfer it to a plate, and set aside. Dry the wok, add the butter and heat it over high heat. 6. When the butter has melted, add the panko and stir-fry gently until the panko is golden brown, about 1 minute. 7. Watch carefully to avoid burning. 8. Transfer the panko to a medium bowl. Wipe out the wok, and heat over high heat. 9. Add the oil and swirl to coat the pan. When the oil is hot, add the garlic, ginger, and maitake and stir-fry until soften, about 2 minutes. 10. Add the cauliflower, oyster sauce and lemon zest and juice. Season with salt and pepper and stir to heat through, 2 to 3 minutes. 11. Make a bed of the rice on a platter, or transfer to four individual serving bowls, and top with the stir-fry. Sprinkle with the panko, garnish with the chives and serve.